The SMART Link-BLT wireless module makes data collection even easier. Paired with the MDT SMART App tablet, you can now take manual readings from our SMART instruments completely wirelessly. Simply mate one of the SMART Link-BLT devices to your SMART instrument (MPBX, Cable, or Contractometer) and leave it in place. The SMART App provides a user-friendly, seamless interface for interaction with SMART Link-485, SMART Link-BLT and SMART Log devices. Designed to simplify collecting readings from instruments, this software takes advantage of modern Android tablets to configure the instruments and perform data processing on-the-go. The Loadsensing LS-G6 Surface Wireless Data Acquisition System is a long-range wireless data acquisition system offers many benefits to engineers. Its ability to provide easily accessible periodic data readings and generate alarms if safety thresholds are exceeded makes it easy to wirelessly monitor all of your surface sensors in real-time, using readily available and commonly used vibrating wire, digital and analogue geotechnical sensors. MDT designs and manufactures custom geotechnical instrumentation for our clients needs. Please browse our most popular products below and contact us with your requirements so we can help make your monitoring project a success. We help you get your data in the most reliable way. Whether it’s a battery-powered data logger for remote areas, or a completely integrated wireless system, MDT will gather all the required information to provide you with a cost-effective solution that meets your needs. With options ranging from PC or tablet apps, to fully web-based solutions hosted in our data centre, MDT has many different software options to help you store and view your data in the safest and most efficient way. Have a look at some of our solutions below. MDT is an instrumentation company specializing in geotechnical applications. Our patented SMART products have been designed to survive the rigours of geotechnical and mining environments while maintaining a low cost and ease of installation. 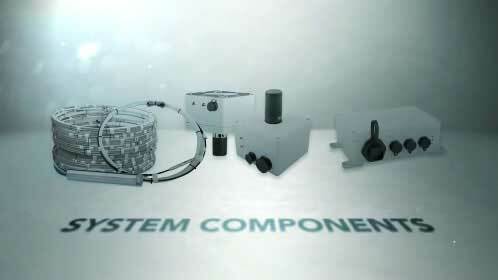 Designed by engineers for engineers, our instruments get the job done without breaking the bank. We now offer wireless communication with our SMART instruments underground! MDT personnel are quality conscious and strive for continuous improvement in all areas of the business. We are proud of our workmanship and attention to detail, beginning with our sales and engineering and continuing through to manufacturing and customer service. In many cases, our staff has demonstrated the ability to work with our customers and assist them in solving their problems. Our ability to attract and retain new customers is a testament to that ability. Contact MDT for more details. Custom instrumentation programs, support design and evaluation, and data interpretation services are also available. Please check out our partner company MD Engineering for more details. Long term mine planning is particularly challenging at Barrick Cortez. Not only is the mine one of the world’s largest gold operations, but it comes with the added complexity of operating both above and below ground simultaneously. To ensure safety and productivity, Barrick’s geologists and engineers rely on accurate and timely data from over 280 wells and piezometers on surface, in addition to more than 100 hydrology and geotechnical instruments underground. Monitoring so many data points in the mine required the team to travel regularly to take manual readings. This was a time intensive process and could be quite difficult as many instruments were in remote locations. Barrick tasked Mine Design Technologies and Newtrax Technologies to help them reduce process time while improving monitoring in real-time. The MDT and Newtrax solution consisted of a world-class multi-hop wireless telemetry system which continuously monitors sensors and relays the information back to a central web interface. The solution contains three components: Ethernet gateways, MineHop wireless nodes and geotechnical & hydrology instruments. The combined system is plug-and-play, truly wireless and the batteries last for years, so it’s very simple and does not interrupt production. Both above and below ground the system works as a mesh, with each node not only collecting data but also acting as a repeater to send data back to the central web server. Each wireless node can monitor multiple instruments and is completely plug and play. It begins sending data to the engineer’s desk as soon as it connects to the mesh network. Above ground, a single node can monitor up to 4 vibrating-wire piezometers. A wireless node is typically mounted on top of a pole and connected to a piezometer in the well by a 12ft cable. The final step is to configure the sampling rate, sensor thresholds and email alarms from the web interface. 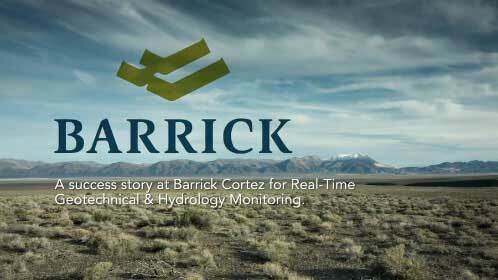 For more information on the Barrick Cortez deployment watch this short video. For more information on how to put MineHop and SMART MPBX instrumentation to work at your mine, contact: wireless@mdt.ca for details. Long term mine planning is particularly challenging at Barrick Cortez. Not only is the mine one of the world’s largest gold operations, but it comes with the added complexity of operating both above and below ground simultaneously. 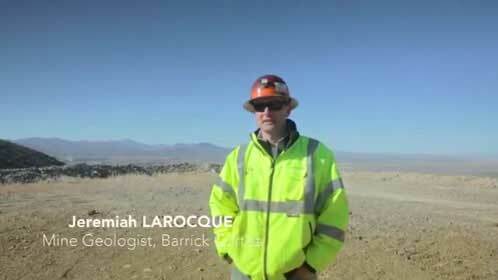 The solution that Barrick implemented was developed by two leading mining technology firms: Mine Design Technologies – a leader in the development and deployment of geotechnical instrumentation designed to function in the most challenging mining environments Newtrax Technologies – a firm specializing in ultra-long life wireless telemetry & networking systems, based in Montreal, Canada. The MDT and Newtrax solution consisted of a world-class multi-hop wireless telemetry system which continuously monitors sensors and relays the information back to a central web interface. The solution contains three components: Ethernet gateways, MineHop wireless nodes and geotechnical & hydrology instruments. Installing a MineHop node is simple. When the node is turned on, it automatically connects to the network. Status LEDs alert users where network signal is strong or weak. The user picks a location where the signal strength is good and mounts the node in place using tie wraps. 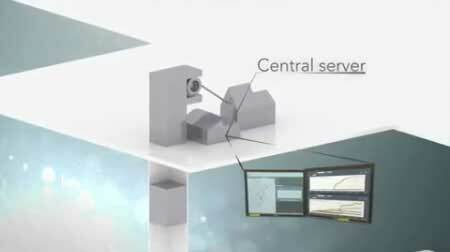 The process is repeated until network connectivity is extended to the target location for instrumentation. The resulting system at Barrick Cortez saves time and money, while ensuring that the Mine Engineers and Geologists get the data they need to properly plan for safe and efficient operations. For more information on how to put MineHop and SMART MPBX instrumentation to work at your mine, contact: wireless@mdt.ca for details.